St. Ignatios is one of the most famous Saints associated with [the Greek island of] Lesvos. He is venerated especially by holy Christians of the Holy Metropolis of Methymnis, where two of the historic monasteries founded by the Saint (the Monasteries of Panagia Myrtidiotissa and Leimonos, dedicated to the Archangel Michael) are located. A testimony of the Saint's honor is the many individuals bearing his name in the province Methymnis. St Ignatios was born in the year 1492 in the village of Faraga (which does not exist today, though it was close to the city of Kalloni). His father Manuel and grandfather George were official [οφφικιούχοι?] priests of the Diocese of Mithymnis. They were descendants of the great family of Agallianon from Constantinople. St. Ignatios was baptized with the name John, and later took the name Ignatios at his Ordination. It is not known what school he attended or where he studied, but it is known that he had much knowledge and a good character and worked to establish and cultivate the consciences of his fellow Christians, and to radiate with teaching and with faith and virtue to all during those dark years of slavery [under the Ottoman Turks] [Είναι Όμως γνωστό ότι είχε και γνώσει πολλές και χαρακτήρα καλόν και κατόρθωσε να επιβληθεί στις συνειδήσεις των χριστιανών, να ακτινοβολεί και με τη διδαχή και με την πίστη και αρετή του σ’ όλα εκείνα τα σκοτεινά χρόνια της σκλαβιάς.]. He was married, had children, and then was ordained a priest with the office of Sakellionos [πήρε το οφφίκιο του Σακελλίωνος?]. Among his other tasks and occupations was to copy books to enrich the library, and write poems (which generally revealed his personality [τη μόρφωσή του?]. During this period, there was a terrible epidemic on the island, which also affected his family. His wife and children died, except for just one child, who later became a monk by the name Methodius, and he continued the work of his father. In the location where today is the Monastery of Leimonos, then was a poor chapel dedicated to the Archangel Michael. This was located on the the large estate which belonged to the father of the Saint, along with that which is the current Convent of Panagia Myrsiniotissas. Both of these were mostly desserted, however. St Ignatios with great and fiery zeal utilized this land for holy purposes. 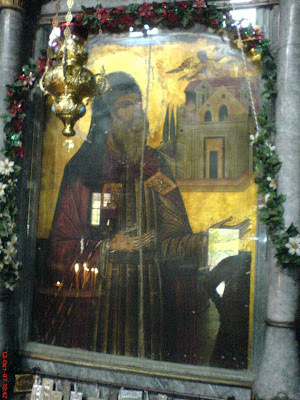 With his personal spending he repaired the dilapidated monastery of Myrsiniotissas, and with the same zeal he founded the monastery of Leimonos, where instead of a small chapel to the Archangel Michael, a large and radiant church arose, which was necessary to house both the many monks who had gathered there, and also the many pilgrims who would come to the monastery. To preserve the monastery from both the rapacious disposition of the Turks, and from bad neighbors, he went to Constantinople and had issued a Patriarchal Act in the year 1530, and decrees of the Turkish Government (firmania) with which the monastery was embodied [κατοχύρωσε?] with property. After the completion of the monastery, for just four years he governed as abbot from 1426-1530, because next year (1531), while in Constantinople, he was elected the Metropolitan of Mithymnis, recognizing «his radiant and angel-like disposition [πολιτείαν?]». 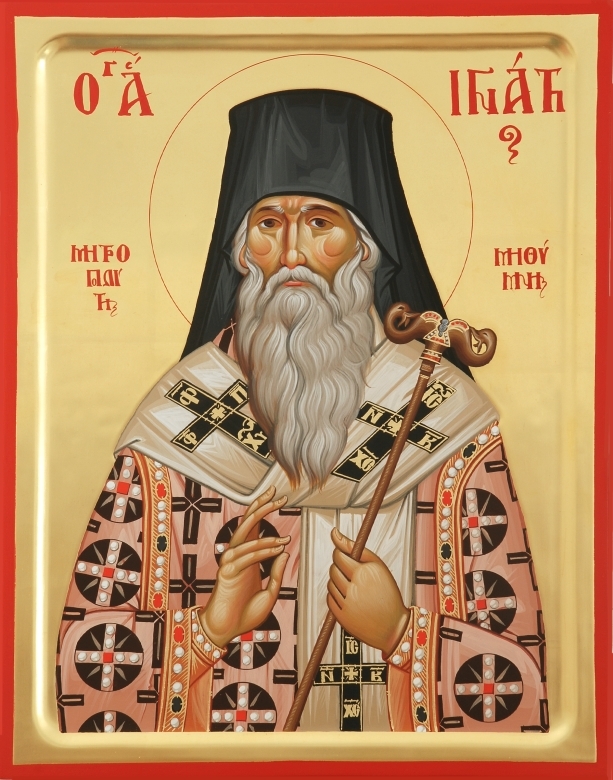 When he accepted the episcopal assignment, he become determined to give all his strength for the administration of the Church, was forced to deliver the care of the monastery of to the monk Methodius (his son). The biographer writes about the saint that he singled himself out from others by his many God-pleasing works [θεάρεστα έργα? ], his teaching, his paternal love, his interest for everyone. It was written characteristically of him: «All ages and stations of people had a father, a teacher, a contemplative advisor», St. Ignatios. His son's Monasteries were not only spiritual centers in those difficult years, and were not only comfort and relief centers for the afflicted Greeks, but also schools that taught the Greek language and history and kept alive Greek identity. In such schools and even the famous «Leimoniada» School the Saint himself taught, along with his Methodius, the wise Pachomios Rousanos, and other wise teachers. The school was maintained until 1923, built and launched the Kalloni schools, which were under the lavish sponsorship [τη δαψιλή χoρηγί?] of the Monastery. 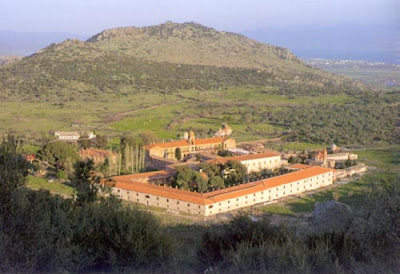 At the end of the year 1563, St. Ignatios asked to resign from the metropolitan throne of Kalloni, to spend the rest of his life like monk in the monasteries. He finally delivered his holy soul to God on the 14th of October 1566. The Christian inhabitants of the surrounding villages buried him with deep sorrow and great honor in the monastery of Myrsiniotissas. 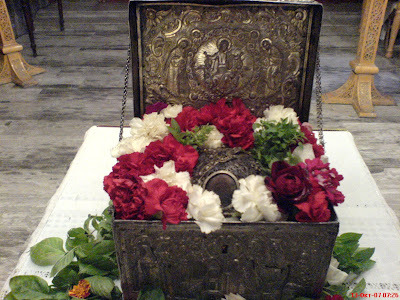 After nine years, when the Patriarch of Alexandria, Silvestros, (a friend of St. Ignatios) had come to Lesvos, he insisted that the relics be uncovered (despite the orders the Saint had given not to open his tomb). When they opened the tomb, they witnessed myrrh and an aroma from the grave and bones, which was another sign of his Holiness. Τον ποιμενάρχην Μηθύμνης Ιγνάτιον άσμασι, * τον μετά πάντων αγίων δοξασθέντα εν θαύμασιν, * υμνήσωμεν απαύστως οι πιστοί, συμφώνως εν τη τούτου εορτή, * και ως πλείστα κατιδόντες υπ' αυτού, * θεραπευθέντα πάθη εκβοήσωμεν * Δόξα τω σε δοξάσαντι, * δόξα τω σε στεφανώσαντι, * δόξα τω ενεργούντι δια σου πάσιν Ιάματα. The Shepherd of Methymna do we praise, O Ignatios, * who with all the saints is glorified with miracles, * and ceaselessly do the faithful hymn, him all together in this present feast * and beholding the many passions healed by him we cry aloud * Glory to Him who glorified you * glory to Him who crowned you, * glory to Him who works healing for all through you. St. Ignatios, intercede for us!